Hey have I got the perfect cookies for you to make for your cookie exchanges and parties for the holidays! I know, we’re a little ahead of schedule, (I can’t help myself!) but I love cookies and I love the holidays because it’s baking time folks! 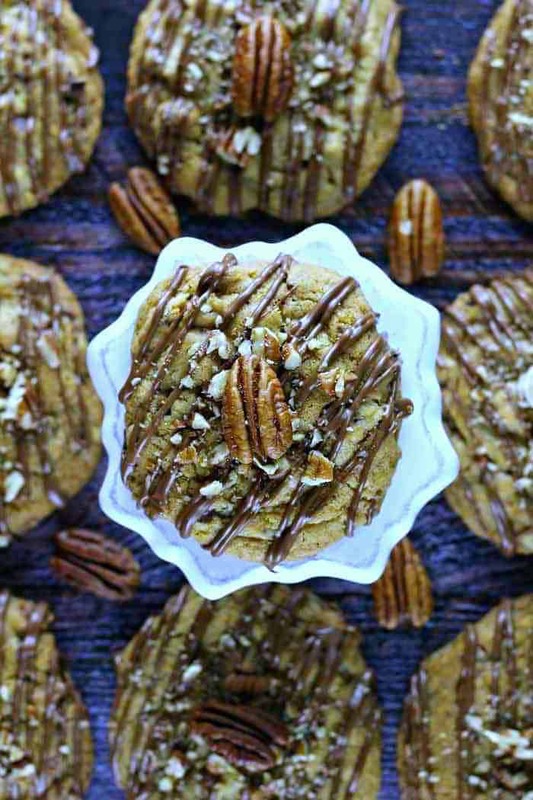 So, let me introduce you to these amazing Butter Pecan Turtle Cookies! They are pretty hip. Let me tell you why! These awesome golden buttery pecan cookies have Ghirardelli Caramel Chips, chopped pecan bits, melted Ghirardelli milk chocolate drizzles on top, a little sea salt (because sea salt with chocolate and caramel is a must!). 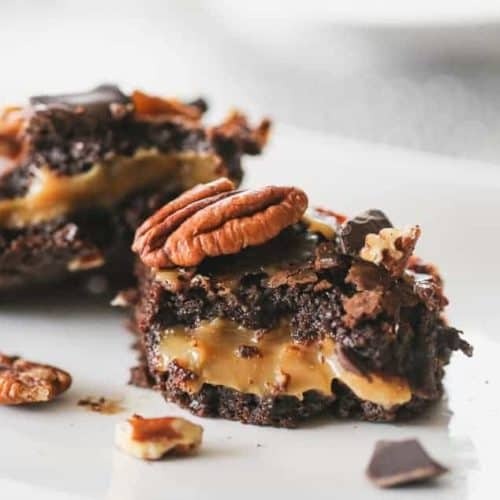 AND….to give it some extra, rich enhanced flavor, I even added in some Nielsen Massey Coffee Extract that I received from Nielsen Massey in a super awesome gift pack they sent me that you would love or anyone you know that bakes would love. When I was adding in the extract part of the recipe, I guess I must have gotten distracted, because I do a lot of multi-tasking, which can be a good thing in my favor or a bad thing that goes horribly wrong. Don’t ask! So, back to my master plan! I thought I was adding vanilla extract and realized “Rut Roh!”. *UmmmSeriously?? * Did I just do what I thought I did? Yup…Whaaa?!! But it ended up being one of those great mistakes that I want to use coffee extract in everything now! haha! So, if you know me at all, once I get hooked on something I keep using it and you’ll probably see it in future recipes on the blog. Spoiler Alert! Don’t get me wrong, vanilla extract would be totally fine in these cookies, but sometimes it’s nice to change it up, right? And for the holidays, it just seems this is the perfect distraction with the caramel chips, pecans and milk chocolate turtle combination. These cookies are the fo-shizzle! 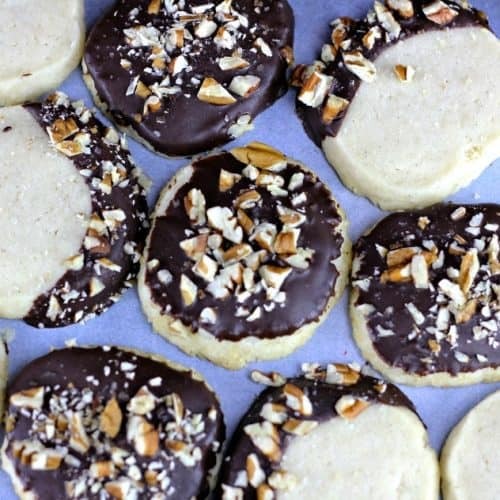 These are the true definition of rich, decadent cookies that everyone will love for the holidays for sure. About the Coffee Extract I used…The rich, freshly brewed flavor of Nielsen-Massey’s Pure Coffee Extract is achieved through their careful distillation of premium coffee beans. The full-bodied flavor enhances frozen desserts, baked goods and cocoa as well as savory dishes, like soups, gravies, tomato sauces and salsas. Plus, this concentrated extract is easier for home cooks to keep on hand, unlike ground coffee or beans, which rapidly lose their flavor. Available in 2- and 4-ounce bottles, 8 bottles to a case and in 18-ounce bottles, 6 bottles to a case. This product is Kosher and Gluten-Free Certified as well as All-Natural, Allergen-Free and GMO-Free. 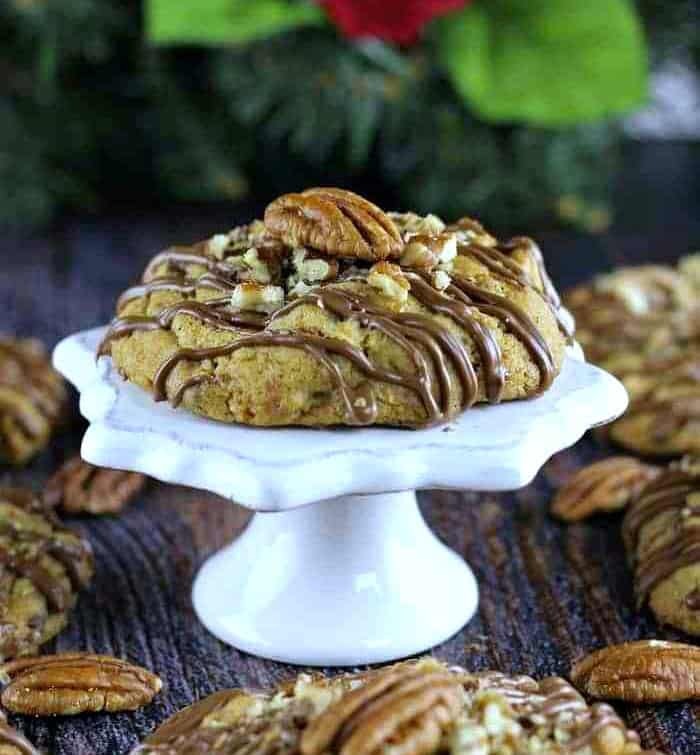 These mouth-watering cookies are buttery, chewy, thick and have caramel chips, chocolate chips, chopped pecans and drizzled with milk chocolate, sprinkled with some chopped pecans and a touch of sea salt. Perfect for the holidays! Add the mini chocolate chips, caramel chips, chopped pecans and stir with a wooden spoon, again no overmixing, just until incorporated. Large cookies bake 10 minutes. Makes 15 - 30 cookies depending on size. If you want to toast the pecans or walnuts, to give it even more intense flavor and crunchiness. For more intense pecan flavor -- Toast nuts is in a medium oven (325°F). Spread them in a single layer on a baking sheet with a rim and toast 5 – 10 minutes until golden brown. 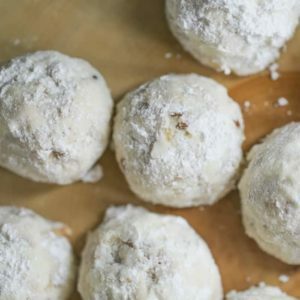 If you want a crisper cookie, bake 2 - 3 minutes longer. For more cookie ideas, check out 50 Favorite Christmas Cookie Recipes over at RecipeLion! 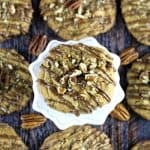 It’s a free eCookbook full of easy cookie recipes and has everything from chocolate Christmas cookies and nutty Christmas cookies to traditional cookie recipes and fruit-filled cookie recipes. YUM! And of course there are like a bajillion here on the blog here. That sounds like the most delicious mistake ever! I think coffee extract combined with butter pecan flavors sounds like a dream! I need to make these when I visit my fam at Christmas :). Hooray for holiday baking! Mmmm I agree that these cookies sound perfect for the holidays! I totally need to try some of that coffee extract! Thanks doll! You will love that coffee extract!! Liz, these Turtle cookies are definitely cookie exchange worthy! Yes! That coffee extract is the bomb! ha! Turtle candies are one of the favorites. How can chocolate, caramel and pecan not taste amazing, right? So, you know that I’m totally in love with these cookies. And I need to get hold of some coffee extract. Sounds heavenly!!! 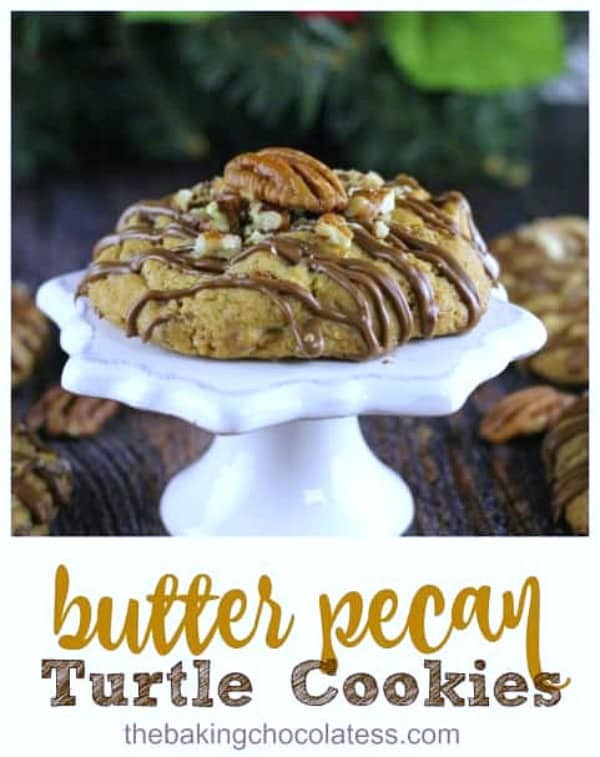 Incorporating the turtles into cookies was an idea I came up with when I wanted to do Butter Pecan Cookies! I love Turtles too and the extract takes them to another level Maria! Thank you!